It's time to break my e-mail/Twitter/Facebook addiction cold turkey. I mean it. Shift is crying out to me with its unfinished scenes (or scenes with three different endings), its feeble prose, its sheer lack of done-nosity. So one last post of Shade giveaways and Neat Stuff. It's the Fresh Fiction Fresh Pick for today. Yay! I got a special icon to display on my website 'n' everything. The amazing Stephanie Kuehnert interviewed Aura for her Women Who Rock Wednesday feature this week, and she's giving away a signed copy of Shade. Deadline: May 19. U.S. residents only. Speaking of character interviews, YA roundup interviewed Aura and Logan separately (although apparently Aura had to translate for Logan since the interviewer was over seventeen), and then me today. 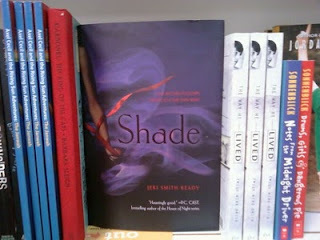 As I mentioned before, they're giving away a signed copy of Shade as well. Deadline: Friday, May 14, 8am Eastern. U.S. Residents only. So a funny thing happened yesterday. One of my lovely Twitter pals sent me a photo of Shade on the shelves of her local bookstore. The funny thing is, two authors to the right is the much-loved, award-reaping Jordan Sonnenblick, who is also one of my former classmates from Kings College (London), where I studied for a semester my junior year in college. At the time (twenty years ago, you do the math), neither of us wanted to be writers. Jordan wanted to teach (which he did), and I wanted to graduate college (my ambitions were slack-aliciously low--can you believe I was once a Type B personality?). Jordan tells the rest of the story on his blog today. If you have pics of Shade in the wild, I would love to see them! No e-mail attachments, please (I get enough of those from family members), but you know where to find me, either here or Twitter or Facebook. And now, it's time for dinner and a long weekend of real writerly work. I shall return to the surface Monday morning with a finished rough draft. OR ELSE YOU MAY MOCK ME!